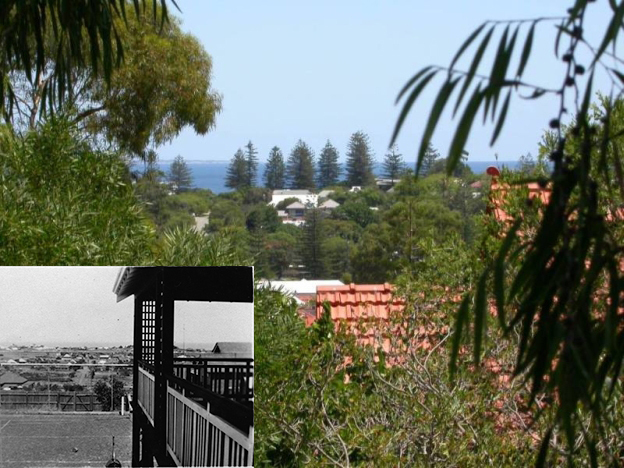 The picture on our home page shows a sketch of our house ("High Beach"), whilst this picture shows a glimpse of the Indian Ocean with Rottnest Island on the horizon at the left. In 2005 Michael Webster distinctly recalled being impressed by the view from the "High Beach" balcony of the British Pacific fleet anchored in Gage Roads on its way to fight the Japanese in the islands in WWII. In those days the view was a lot less obscured than it is now. Bulloch Bros postcard with the hand written date "8/12/16" . Addressed to Mrs R Mason in Albany from her brother Ted. Ralph H Mason married Violet A Bailey in 1912. Possibly taken from the top of the Osborne steps. 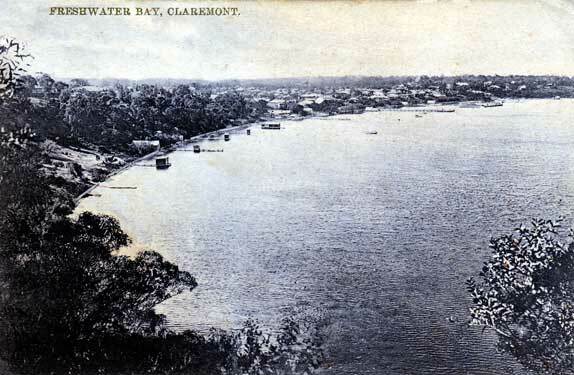 People living in the this area of Cottesloe (some of which is now in the Town of Claremont) used to give their address as Osborne instead of Cottesloe. The name came from the Osborne Hotel which later became part of Loreto Convent. A popular way of arriving at the hotel was by river. 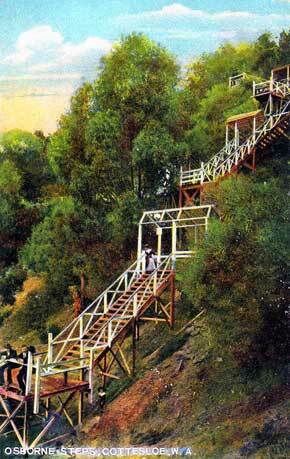 There was a landing at the foot of the cliff and ferries from Perth would bring customers who then climbed the "Osborne Steps" to reach the grounds of the hotel.